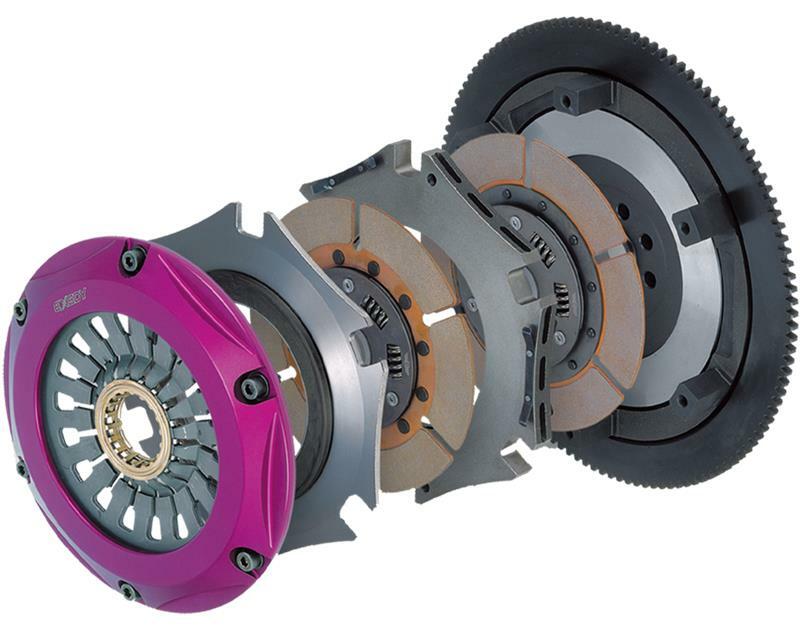 For high-powered applications, EXEDY offers twin and triple Multi-Plate clutches. These are designed for high power street action as well as drag, road and rally racing. The twin plate clutches are rated for approximately 500 ft/lbs of torque and the triple plates are rated for approximately 800 ft/lbs of torque, both figures at the flywheel. Twins come with both spring damper discs or solid discs depending on application, whereas triples are all solid discs and not recommended for street use. All EXEDY Hyper Multi-Plate clutches come with a lightweight, chromoly steel flywheel and the famous purple anodized forged aluminum clutch cover. Depending on the application, we have both strap drive and lug drive models. All have T5001 cerametallic friction materials for extreme heat resistance. Surprisingly, even with it’s additional power capability, most multi-plate clutches exhibit light pedal pressure thanks to a half-engaged “zone” provided by the patented clutch “cushion” function. This model has been developed for high powered street cars and race cars with up to approximately 600TQ @ FW. They feature ventilated, thick intermediate plates for improved life and spring damper discs to protect your transmission and drive line. “HD” kits have slightly high clamp load than their “SD” counterparts and have approximately 20% higher power capacity. This model has been developed for high performance street cars with up to approximately 550TQ @ FW. They feature full faced organic friction discs for improved drivability while maintaining excellent power holding capability. These clutch covers are designed to achieve a clamping load that is approx. 40% higher than the genuine part allowing a higher torque transmitting capacity. Ductile material is used for all pressure plates and, high burst strength can be achieved in all temperature ranges. This model has three plates and is developed specifically for high power applications such as over 800 ft/lbs of torque at the flywheel for drag racing. It handles high torque loads and shifts smooth, and because of the lightweight clutch discs, you can reduce your shift times. All EXEDY Racing Hyper Multi Series Clutch Kits carry SFI 1.2/1.5 Certification. Which means, when you buy these products, you can be confident they are certified for use in competitive motorsports. PLEASE NOTE: All referenced torque ratings are measured at the wheels.